Not long ago, AT&T added a couple of premium Android tablets to its roster – the 12.2-inch Samsung Galaxy Note Pro and the Galaxy Tab 4 10.1. From the looks of it, a more affordable slate is also about to join the party in the near future. Or at least that's the conclusion we've arrived at after discovering a tablet labeled as SM-T337A in the FCC's database. This not-so-mysterious Samsung SM-T337A is a tablet destined for AT&T – it supports the carrier's LTE bands, but what's more revealing is the AT&T logo etched on its back side. Dimensions are as follows: the device is 209.8 millimeters tall by 123.8 millimeters wide (that is 8.26 by 4.87 inches) – a match with the proportions of the Samsung Galaxy Tab 4 8.0. 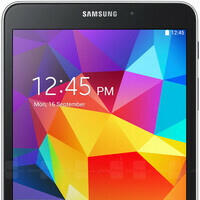 The Samsung Galaxy Tab 4 8.0 is an 8-inch Android tablet with a display resolution of 800 by 1280 pixels. Inside it runs a quad-core Snapdragon 400 SoC with a 1.2GHz maximum clock frequency, and a 3MP camera is placed on its back. Note that these are the specs of the international Galaxy Tab 4 8.0 variant, but we doubt that the yet-unconfirmed AT&T model would be any different in terms of hardware, save for its LTE capabilities. Now that we're at it, we must mention that the Samsung SM-T337A has been certified by the Wi-Fi alliance, where it is clearly stated that it is an Android-powered tablet. A tablet with the model name SM-T337T is also listed in the alliance's database, which suggests that the very same Samsung Galaxy Tab 4 8.0 tablet could arrive on T-Mobile as well. Meanwhile, the Verizon-branded SM-T337V has yet to be announced officially, even though it has been two months since we saw it at the FCC. There must be some terrible pricing on Qualcomm chips. There is no reason this tablet or any name brand tablet shouldn't have a Qualcomm 800 or better chip. The 800 is a mature chip and its price should be quite low by now. Same goes with RAM. The cost of differential of materials and manufacturing for Samsung on 1GB vs. 1.5GB vs. 2GB of RAM is tiny. As a customer, I'd much rather choose amongst tablet with similar processors/RAM but different screen sizes/resolutions/types than be stuck with the "mini" approach so popular in Android, where "mini" = "junior, downsized, crippled".